The chronic stage of spinal cord disease is usually initiated one month after the initial insult and continues for six months. Some cases seem to continue to improve over a period of two years. Most severe insults to the spinal cord result in the formation of a cyst structure within the spinal cord tissue. This cyst is called a Glial Scar and it is difficult for healing nerves and axons to penetrate. Also, because the active inflammation and active healing have subsided after over a month past the initial insult it is difficult to stimulate the nerves to “want” to heal. The pet has usually adapted to the new condition and is using the front legs and does not “think” to use the back legs for movement. Stem Cell Therapy during the chronic stage of the disease is still effective at reinitiating regeneration and healing but the stem cells must be injected directly into the glial scar or just above the glial scar to be effective. Homing of the stem cells is no longer rational as there is no longer inflammation to attract the cells to the area of damage. To accurately inject this area, imaging such as MRI is necessary to identify the scar area. Then the use of advanced imaging from a C- Arm is required to avoid surgery for this process. The glial scar is composed of a cyst containing chemicals that inhibit axon growth. This matrix inside the cyst is made of chondroitin sulfate proteoglycans. Chondroitinase ABC (chABC) digests this and treatment has resulted in enhanced regenerative response from axons. chABC is being evaluated as a therapy for dogs with chronic spinal cord injury and should be a part of our arsenal in the near future. Stem cells can reignite the healing process but healing must be directed, guided, refined if the new nerves and axons are to function properly. This requires physical therapy which provides stimulation from the brain down the spinal cord and stimulates the nerves in the legs to promote signals up toward the brain. Without these signals, the new nerves do not “know” how to function. During the chronic phase the pet will have regained strength and improved compensation to the neurologic disease. This means the pet is happy, no longer feels pain associated with her disc lesion and is happy to motivate using only the front legs. During this stage the pet needs to be taught to slow down and use the back legs for movement. They become so strong in the front legs that they can move very well without the back legs. This is bad for continued rehabilitation. We need to try to use the back legs and not “forget” that they are needed. Otherwise the pet will shift the center of gravity forward and use the back legs only as props. In the chronic stage of neuron damage recovery, the major repair mechanism for the spinal cord is the recruitment of undamaged nerves to perform the tasks of nerves that were destroyed. This recruitment or re-tasking, or learning is an active process that must be promoted by the caretakers of the pet who has undergone this type of injury. Stem Cell therapy helps with the regeneration of neurons yet this is a slower process than re-tasking of existing neurons. The pet may have movement of the thigh and hip muscles at a walk. This means the connection from the brain to her rear limbs is still intact and now we know the pet can eventually learn to walk again by reassigning nerves to new functions. This is called “functional recovery” function restoration occurs because of physical therapy that slow down the movements of the front legs so the back legs are encouraged to move. 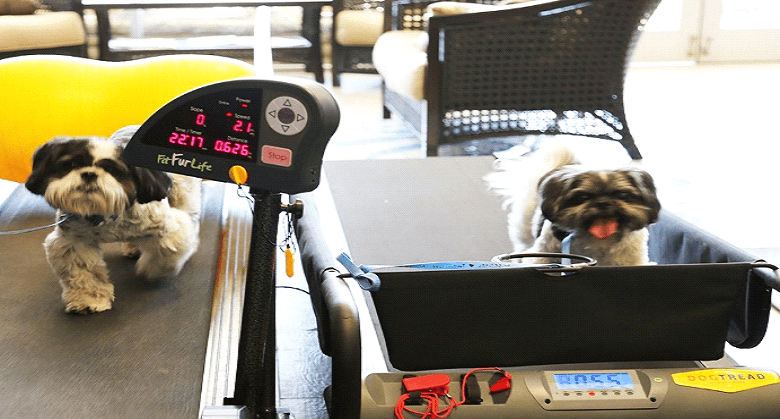 This can be done in the water treadmill which supports the body weight while providing protection from falling through the buoyancy of the water and using the workout to fatigue the front legs so that the back legs are recruited for motion. The signals from the brain through the surviving nerves cause new neural connections and cross connections building logic units in the spinal cord that will eventually allow the pet to walk. Physical therapy outside the water treadmill is designed to slow the front end while the rear end is encouraged to participate. This is done by using treats to encourage the pet to climb up stairs, up onto Pilates or onto inflatable “balls” and to balance while supported on unstable surfaces. The purpose is to recruit the rear legs. In addition, the sensory nerves that allow the pet to feel her feet must be re-calibrated. The patient will have diminished sensations at first but as the nerves reconnect or re-task other nerves they will not know how strong an impulse they must send to the brain to let it know when the foot is touched. So, these new nerves are overly sensitive and must be retrained. This is called desensitization and is an important part of the therapy. By varying the texture of the surface that the pet walks on during therapy we can start to desensitize these nerves. Nerves that are not used, do not heal. Nerves that are not stimulated, from the brain down the spinal cord and up from the feet and legs atrophy, may never heal. As discussed above most nerve healing is not regeneration but functional re-tasking. For this to occur there must be a need that is perceived by the spinal cord and the sooner the better. Stem Cell therapy helps grow new nerves and helps repair damaged nerves but this is now a slower process than the recovery of function. Even new nerves regenerated through stem cell therapy must relearn their function. Spinal Cord Injury progresses through time sensitive stages that require different strategies for managing the events in each stage in an effort to first preserve as many neurons as possible then to regenerate and re-task as many neurons as possible so that we can have a return to function or functional recovery. The early management of the events is perhaps the most important and there is much misinformation about what to do. There are many newer therapies that when combined with stem cell therapy offer a much better chance for recovery from this disease. How do Stem Cells Repair the Spinal Cord?